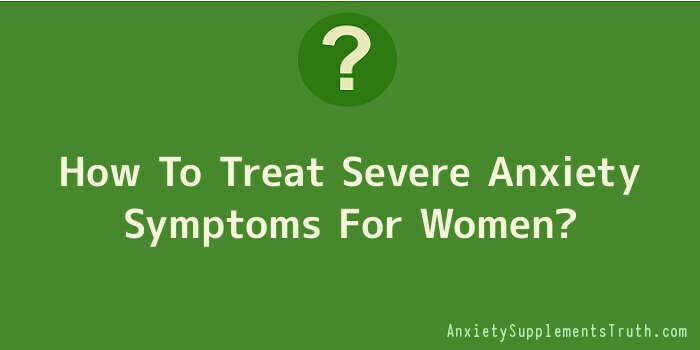 How To Treat Severe Anxiety Symptoms For Women? A prolonged anxiety in women can cause different kinds of disorders. The very first onset of this situation is like an alarm bell – act now otherwise it will be too late. Hence, it is advised by the experts not to take it for granted. The longer it will stay in your body – the longer it will take to go. We can conquer this battle by many ways. Generally, people think that every disorder needs a Doctor’s prescription to get over but food therapy is one of the most enjoyable therapies. Find here some Do’s and Don’ts to treat anxiety symptoms in women. Don’ts – Lessen your sugar intake, say no to junk and processed food. Stop taking liquor. Stay away from foods which are rich in Omega-6 fatty acid. Do’s – include omega-3 in your diet; eat protein rich and complex carbohydrate diets. Eat whole grain and green vegetables which have B complex vitamins, magnesium, and selenium and folic acid. Many observations and research has proved that anxiety can be treated successfully by meditation and yoga. Try some ‘Asanas’ (yoga postures) and learn how to relax. The simple formula is to go out and have fun. Try shopping; go for a spa or anything which makes you feel comfortable. Be social, interact with people and get along with new friends, knowing new people and exchanging ideas can calm you. Talking therapy can be fruitful if done by an experienced person because he can dig out the cause of the anxiety which lies within you. Your mentor can analyze your shortcomings and evaluate the seriousness of the problem. This is a treatment done by an expert who deals with similar kind of situations. Generally, anxiety symptoms in women can be cured by this method. A counsellor can make the disorder heal much faster. Regular exercise can lower the risk of anxiety by releasing endorphins in your body. The release of this hormone will make you feel happy and rejuvenating. Experts believe that a short and regular session of 20 minutes, three to four times a week can serve the purpose. And the last but not the least, medication should be taken with the proper prescription of a medical practitioner. The prescription may include sleeping pills to relax you. The treatment of anxiety symptoms in women may include Serotonin and Venalafaxin. Before starting any treatment you must know about its side effects and duration of the treatment. Following above methods will help you to relieve from severe anxiety.